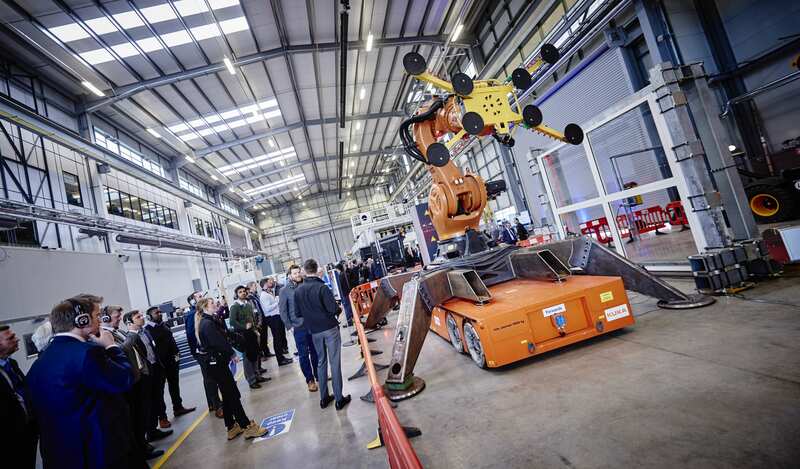 The Manufacturing Technology Centre asked us to manage the event production of their ‘Working Together: Transforming Construction’ showcase event. This is where their team of highly skilled engineers would show over 100 key stakeholders in the UK construction and infrastructure sector from industry, government, academia and research the latest technology milestones in construction. Robotic assembly, large volume metrology, wearables, smart tools and ergonomic improvements were demonstrated in the MTC’s state-of-the-art facility. The event ran from morning until afternoon, hosting speaker presentations in the morning and a technology showcase in the afternoon. Channel 4’s Restoration Man George Clarke joined the event to lend his support to the movement to introduce new technologies and approaches to the construction sector. -The event would be split across two buildings - how will people know where to go without getting confused? - The afternoon venue workshop was extremely noisy - how do we supply sound to four different demonstration areas avoiding sound clashes? - We had 4 different groups rotating around 4 different demonstration areas, all wearing wireless 3 channel headsets, an obstacle for us was how do we inform/ensure each attendee is on the right channel at the right station? Due to the nature of the event we didn’t want attendees swapping headsets but only had 3 channels and 4 demonstration areas. We also needed to make sure each group rotated at the exact time to avoid mixed groups and channel interference. We provided wireless headsets with LED lights to indicate what channel their headsets should be on at each station, we used powerful wireless uplighters to colour each demonstration area based on the headset channel colours. This indicated to attendees which channel they should be on. This also helped us to visually identify if anyone was on the wrong channel at their demo zone. To ensure each group rotated at the same time we played music when it was time to rotate and hooked the group chaperones to lapel mics, so they could still talk to their groups when switching between channels. We set up a 4 speaker PA system for the 4th area which worked well as a solution with the headsets being soundproof. Appropriate level of AV for the morning session of the event where guest speakers would present presentations to attendees. 140 3-channel wireless headsets with led lights to signify selected channel. Wireless uplighters to highlight each demonstration area to inform attendees which channel their headset should be on depending on which demonstration they are at. 65” plasma screens and laptops for each demonstration area to showcase video content. Lapel mics for group chaperones and wireless handheld mics for presenters. Staging and lectern mic for George Clarke’s speech. Free standing signage posts to direct guests to registration, lecture theatre, exhibition room and each demonstration zone.